Got a taste for travel? Give these 10 foods a try! This dark brown food paste is meant to be used as a spread on sandwiches and toast or as a filling for pastries. Made from leftover brewer’s yeast extract with various vegetable and spice additives, Vegemite is either loved or hated by its Aussie consumers. What better way to experience the “land down under” than through your taste buds? Although the origin of this Cuban meal remains a mystery, the delicacy of it does not. The name may translate to “old clothes,” but don’t let that fool you. The shredded flank steak in tomato sauce base served with black beans and rice creates a dish to savor. This Costa Rican delight is often served for breakfast, lunch or dinner. It consists of rice and black beans, usually served with scrambled eggs and fried plantain. One cannot go to Costa Rica without giving this dish a try. Koshari is a dish commonly sold by vendors on the streets in Egypt. It is said that every Egyptian can recognize the sound of Koshari being made because of the sound the spoon makes when it clinks on the bowl as the vendor adds ingredients. This national dish of Egypt is a combination of lentils, macaroni noodles and rice, then it is topped with a spicy tomato sauce that contains a Middle Eastern spice blend, garbanzo beans and fried onions. Named after the type of oven it's cooked in (a tandoor), tandoori chicken is a simple and common dish in India. The chicken is marinated in yogurt and seasoned with a mixture of spices. Served since the imperial era in China, Peking duck is cherished for its thin, crisp skin. Usually, more skin than meat is served with scallions, cucumber and sweet bean sauce. Ducks are bred specially for this dish to ensure it will be to the highest quality. Not to be confused with yogurt, skyr is a popular snack in Iceland. Technically a soft cheese made of gelatinous milk curds, it is mixed with milk and served with sugar or Icelandic blueberries. This national dish of Tanzania is made of cornmeal cooked with water to a porridge- or dough-like consistency. 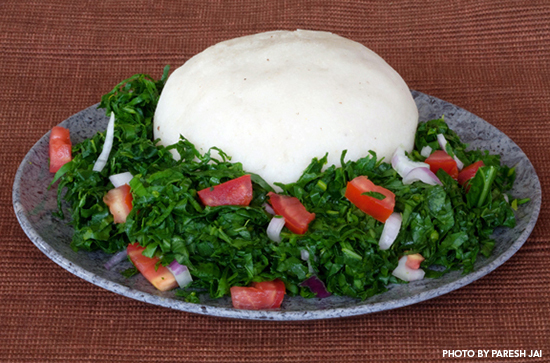 The most common way to eat it ugali is to roll it into a ball, then dip it into a vegetable soup or meat stew. It is most popular in rural areas because it is filling and inexpensive. New Zealand’s sheep population is around 31 million (7 sheep for every 1 person), so lamb and mutton can be found on almost every menu. From fine dining to a local Subway restaurant, this meat is worth a try since there's no escaping it. Raw walu (Spanish mackerel) marinated in coconut cream and lime, served with onions and tomatoes. This dish has worked its way into hotel menus all over the islands of the Fiji. Would you try these foods? What are some of your favorite foreign dishes?